Quality Union Made Political Products, including Signs, T-Shirts, Banners, Buttons, Bumper and Lapel Stickers, Bio Cards, Doorhangers, Post Cards, Business Cards, Golf Outing Sponsor Signs, Special Event Signs, Embroidery. 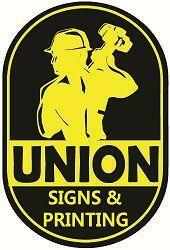 We are members of Sign and Display Local # 830 an Affiliate of the Painters and Allied Trades. Union Bug printed on all items. Design / Layout service available.